One exercise that often needs to be done either by fixed income analysts is to generate a forecast inflation series. For an economist, such forecasts are often part of the job description. For a fixed income analyst, even if they are not attempting to forecast inflation themselves, they will need to generate the forecast series to calculate cash flows. For example, we need to calculate an implied inflation forecast to build up a fitted inflation breakeven curve. One thing to keep in mind is that we need a forecast series that is not seasonally adjusted to be useful for inflation-linked bond analytics, but it is often easier to generate a seasonally adjusted series. Extracting the seasonal pattern is an important analytical exercise. Purists might be tempted to seasonally adjust the data themselves, but that poses a risk. If you do it yourself, you will end up working with your own data set, and you could then into arguments about the data with others (who will invariably use the seasonally adjusted series supplied by the national statistical agency). Using the official data eliminates one of the many potential sources of analytical friction. Meanwhile, this is also the easiest solution: you get the seasonal pattern by dividing the non-seasonally adjusted series by the seasonally adjusted one, as shown below. 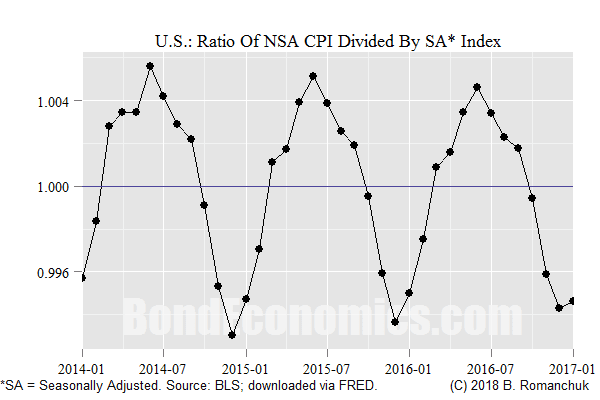 The figure above shows the pattern created by dividing the non-seasonally adjusted (NSA) series by the seasonally adjusted (SA) series. The last point shown is for January 2017, and is equal to 0.9946 (rounded). This means that the non-seasonally adjusted series is 99.46% of the seasonally adjusted series at that date. We see that there is a dip around December each year, and a peak in the summer around June. In 2016, the peak was in June, at 1.0046, and the low was in December at 0.9943 (both numbers rounded). The ratio between those two factors is 0.9896, which implies that there is a 1.05% drop from June to December – 105 basis points, non-annualised. As seen above, the seasonal adjustment pattern for the U.S. CPI has been relatively stable over time (which is expected based on the construction method). It would be relatively reasonable shortcut to extrapolate the last year’s factors going forward. This allows us to take seasonally adjusted CPI forecasts (which are presumably easier to generate), and use them to generate non-seasonally adjusted forecasts. The methodology can then be summarised. Take the official CPI series for the past year, and divide the non-seasonally adjusted series by the seasonally adjusted series. Preserve the last 12 months of data. Generate a seasonally adjusted CPI forecast (somehow). Multiply the forecast series by a series created by repeating the 12-month pattern of seasonal adjustments calculated in step (1). I would expect that this technique appears extremely obvious for many readers. However, I spelled out the procedure, as it was not actually obvious to me when I first had to do the operation. My problem was that when I started in finance, I was a freshly minted applied mathematics Ph.D.; I wanted to find the most “rigorous” solution. This led me on a blind path: I wanted to work with the official seasonal adjustment algorithm. The problem is that the seasonal adjustment algorithm is described as mapping a non-seasonally adjusted series to a seasonally-adjusted one; inverting that mapping is non-trivial. However, given the uncertainty of an inflation forecast in the first place, who cares about getting the inverse mapping exactly correct? Approximations are your friend; you just need to know when precision matters (e.g., getting invoice prices and market quotes correct). How useful did you find time series regression forecasts in practice for finance/economics? I always thought it was a very fancy way of disappointing yourself. The top down macro models that many academics want to build are pretty disappointing. I think those style of models may have worked in the 1970s, when you had a lot of cyclical inflationary pressure from things like indexed wage contracts. In the post-1990 world, core inflation tends to revert to 2% or so; just using that as a “model” outperforms a lot of other proposed top down models. But on a short horizon, I believe that you can model CPI on a component-by-component basis. Each component might have a different model structure. Doing that consistently is a full time job, but that’s what people are paid to do in the inflation-linked market. The forecast horizon is typically not long (under a year), but that’s good enough for a lot of relative value work. Since it’s easiest to build those models on a seasonally-adjusted basis, you need to reimpose seasonality, as seasonality matters a lot for shorted-dated carry.